Hydraulically control your plow position from the seat of your UTV with the Eagle Motion Pacs by KYB. 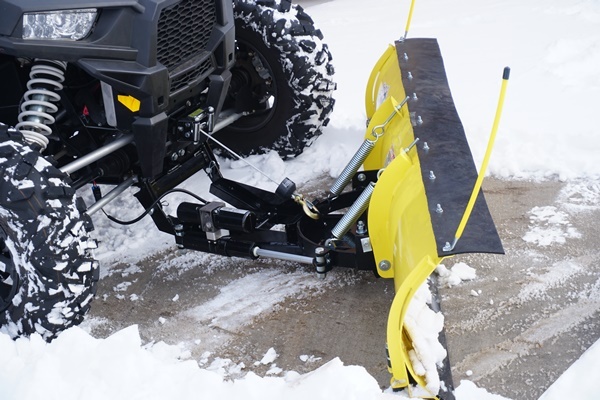 Powered by a single, ¾” chrome hydraulic shaft, Eagle Plow Blades can move snow exactly where you want it! These kits are manufactured and assembled for front mount UTV plow systems. Different lengths are available for machines with tires and tracks. Kits are sold as complete units and include the required push tube, wiring harness, hydraulic cylinder and swivel system. Know that no drilling is required but some assembly will be needed to get your machine ready to roll. Main components of this kit are made in the USA from American materials and are powder-coated with a Jet Black finish. Will work with any Eagle Standard or Country Blade!